در این تحقیق برای اولین بار تاثیر پارامترهایی نظیر سفتی موضعی هوشمند و ابعاد جسم متصله هوشمند حافظه‌دار در رفتار دینامیکی ورق‌های ضخیم با حضور جسم متصله هوشمند حافظه‌دار بررسی شده است. 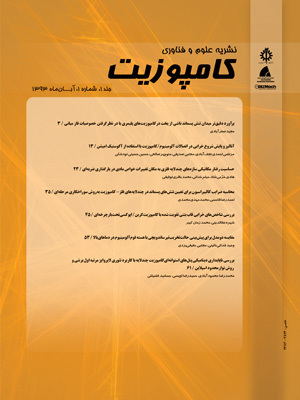 در بدست آوردن معادلات حاکمه‌ی حرکت این ورق از تئوری مرتبه بالای 12 مولفه‌ایی گارک- کانت استفاده شده است که در این حالت اثرات ناشی از آلیاژهای حافظه‌دار و سفتی موضعی جسم متصله در نظر گرفته شده و در ادامه معادلات ارتعاشی ورق حامل جسم متصله هوشمند دارای آلیاژ حافظه‌دار با استفاده از اصل همیلتون بدست آورده شده است. به جهت گسسته سازی سیستم از روش گلرکین استفاده گردیده و سپس ماتریس‌های سفتی و جرمی سیستم مذکور برای دستیابی به یک مسئله ارتعاشی استاندارد مقادیر ویژه استخراج شده است. فرکانس‌های ارتعاشی سیستم محاسبه شده با نتایج مقالات و مجلات معتبر مقایسه و اثر پارامترهای مختلف ورق ضخیم ارزیابی شده است. نتایج حاصله نشان می‌دهد در نظر گرفتن سفتی موضعی جسم متصله ناشی از اثر آلیاژهای حافظه‌دار و سفتی خود ورق، نقش قابل ملاحظه‌ایی در رفتار ارتعاشاتی ورق‌ها دارد به گونه‌ایی که در صورت عدم فعالسازی مناسب هر یک از پارامترهای مختلف آلیاژ حافظه‌دار و یا در نظر نگرفتن سفتی جسم متصله هوشمند حافظه‌دار تغییرات در پاسخ‌های سیستم قابل ملاحظه خواهد بود. همچنین ابعاد جسم متصله نیز دارای اهمیتی خاص خواهد بود زیرا که اثر وزن آلیاژ حافظه‌دار، جسم متصله و همچنین نیروهای ناشی از استحاله‌ی آلیاژهای حافظه‌دار هر کدام تاثیرات زیاد بعضاً ناهمسویی بر ارتعاشات سیستم دارند. This article for the first time is concerned with effects of parameters as local smart stiffness and smart attached mass dimensions of dynamic behavior of thick laminated plates with attached mass. In deriving governing equations, Gark-Kant’s higher order theory is used and effects of SMA and attached mass`s stiffness taken into account and finally vibration equations of thick plate carrying attached mass contain SMA is reached by using Hamilton`s principal. Then by means of Galerkin method, mass and stiffness matrices are extracted for achieving to a standard eigenvalue vibration problem. In this problem simply supported boundary condition is used for each four edges. Some important parameters such as ratio of local stiffness to stiffness of host structure and smart attached mass dimension on main frequencies of laminated thick plate is studied. A Comparative result with those in published references is presented. These numerical results show that local stiffness due to smart attached mass has a great role on dynamic behavior of thick laminated plates that if SMA didn`t active properly or ignore the effect of attached mass`s stiffness the dynamic response of system will have a lot of changes. Yang, P. C., Norris, C. H. and Stavsky, Y., "Elastic Wave Propagation in Heterogeneous Plates", International Journal of Solids and Structures, Vol. 2, No. 4, pp. 665-684, 1966. Kant, T., Owen, D. R. J. and Zienkiewicz, O. C., "A Refined Higher Order Co Plate Bending Element", Computers and Structures, Vol. 15, No. 2, pp. 177–183, 1982. Gorman, DJ. and Singal, RK., "Analytical and Experimental Study of Vibrating Rectangular Plates on Rigid Point Supports", AIAA Journal, Vol. 29, No. 5, pp. 838-844, 1991. Rossi, R. E. and Laura, P. A. A., "Symmetric and Antisymmetric Normal Modes of a Cantilever Rectangular Plate :Effect of Poisson's Ratio and a Concentrated Mass", Journal of Sound and Vibration, Vol. 195, No. 1, pp. 142-148, 1996. Kopmaz, O. and Telli, S., "Free Vibration of Rectangular Plate Carrying a Distributed Mass", Journal of Sound and Vibration, Vol. 251, No. 1, pp. 39-57, 2002. Wong, W. O., "The Effect of Distributed Mass Loading on Plate Vibration Behavior", Journal of Sound and Vibration, Vol. 252, No. 3, pp. 577-583, 2002. Alibeiglooa, A., Shakeri, M. and Kari, M. R., "Free Vibration Analysis of Antisymmetric Laminated Rectangular Plates with Distributed Patch Mass Using Third-Order Shear Deformation Theory", Ocean Engineering, Vol. 35, No. 2, pp. 183-190, 2008. Ostachowicz, W., krawczuk, M. and Zak, A., "Dynamic and Buckling of a Multilayer Composite Plate with Embedded SMA Wires", Composite structures, Vol. 48, No. 1-3, pp. 163-167, 2000. Lau, K. T., Zhou, L. M. and Tao, X. M., "Control of Natural Frequencies of a Clamped-Clamped Composite Beam with Embedded Shape Memory Alloy Wires", Composite Structures, Vol. 58, No. 1, pp. 39-47, 2002. Mozafari, A., Malekzade, K., Ahmadi, M. and Azarnia, A. H., "Analyze Of Free Vibration Of Composite Plate With Embedded Shape Memory Alloy", in ISME16, Kerman, 2008. Zhang, R. X., Ni, Q. Q., Masuda, A., Yamamura, T. and Iwamoto, M., "Vibration Characteristics of Laminated Composite Plates with Embedded Shape Memory Alloys", Composite Structures, Vol. 74, No. 4, pp. 389-398, 2006. Park, J. S., Kim, J. H. and Moon, S. H., "Vibration of Thermally Post-Buckled Composite Plates Embedded with Shape Memory Alloy Fibers", Composite Structures, Vol. 63, No. 2, pp. 179–188, 2004. Ni, Q. Q., Zhang, R. X., Natsuki, T. and Iwamoto, M., "Stiffness and Vibration Characteristics of SMA/ER3 Composites with Shap Memory Alloy Short Fibers", Composite Structures, Vol. 79, No. 4, pp. 501-507, 2007. Zhang, Y. and Zhao, Y. P., "A Study of Composite Beam with Shape Memory Alloy Arbitrarily Embedded Under Thermal and Mechanical Loadings", Materials and Design, Vol. 28, No. 4, pp. 1096-1115, 2007. John, S. and Hariri, M., "Effect of Shape Memory Alloy Actuation on the Dynamic Respons of Polymeric Composite Plates", Composites Part A: Applied Science and Manufacturing, Vol. 39, No. 5, pp. 769-776, 2008. Ibrahim, H. H., Yoo, H. H. and Lee, K. S ., "Aero-Termo-Mechanical Characteristics of Imperfact Shap Memory Alloy Hybrid Composite Panels", Journal o Sound and Vibration, Vol. 325, No. 3, pp. 583-596, 2009. Kuo, S. Y., Shiau, L. C. and Chen, K. H., "Buckling Analysis of Shape Memory Alloy Reinforced Composite Laminates", Composite Structures, Vol. 90, No. 2, pp. 188-195, 2009. Malekzadeha, K., Mozafari, A. and Ghasemi, F. A., "Free Vibration Response of a Multilayer Smart Hybrid Composite Plate with Embedded SMA wires", Solids And Structures, Vol. 11, No. 2, pp. 279 - 298, 2014. Garg, A. K., Khare, R. . and Kant, T., "Higher-Order Closed-Form Solutions for Free Vibration of Laminated Composite and Sandwich Shells", Sandwich Structures and Materials, Vol. 8, No. 3, pp. 205-235, 2006. Sadd, M. H., “Elasticity: Theory and Applications”, Second Edition, 1993. Reddy, J. N., “Mechanics of Laminated Composite Plates and Shells”, 2nd Edition, CRC Press, 2004. Reddy, J. N., “ Energy Principles and Variational Methods in Applied Mechanics”, 2nd Edition, John Wiley and Sons, 2002.